With the U.S. economy grappling with massive internal debt, ideas that can reduce even a fraction of this would be of great advantage. Financial institutions as well as startups have already begun looking for ways to innovate, and make banking systems more efficient which allows financial institutions to the lending problem effectively. Interestingly, lending can be seen as a big data problem making it naturally suited for machine learning. As part of their strategy to become efficient, profitable new age digital lenders, financial institutions can optimize their lending processes to support proactive loan decisions by leveraging AI-driven advanced analytics. Traditional loan underwriting methods depend heavily on scores provided by credit bureaux. While credit score verification may be the first step towards filtering out likely defaulters, they could fail to capture complex patterns in loan repayments. Banks are now adopting general AI-powered tools such as chatbots, customer relationship management tools, social media footprints and real-time analytics to gauge creditworthiness more accurately. One banking application looks at a potential applicants’ entire digital footprint to determine their creditworthiness by having individuals download their app. It looks at over 12,000 variables including social media account use, internet browsing, geolocation data, and other smartphone information. The machine learning algorithm turns all this data into a credit score, which banks and other lenders can use. The application does not share personal data with lenders to protect individuals’ privacy but only the final result of their analysis. This has allowed their partners to approve up to 50 percent more applications. Cognitive AI applications which help students pay off their student loans faster uses machine learning to analyze the individual’s financial habits to determine if they can afford to pay back their loans faster, besides also automatically prompting how much more they should contribute. The use of machine learning to analyze alternative data in loans and credit rating may raise some privacy, ethical, and legal concerns. People might not feel comfortable with a financial institution having access to all sensitive information about their life. Even if all these institutions behave ethically, the more data they hold the more that can be stolen by malicious hackers during a data breach. Even with these concerns, the use of machine learning to process alternative data to determine creditworthiness will grow significantly. 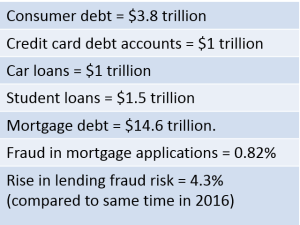 There are billions of people who are unbanked or with a disorderly financial spending pattern to whom financial institutions may one day offer mortgages, payment plans for products, credit cards, or other loans. The financial appeal of these tools is obvious. It is reasonable to believe that the more information you gather about an individual, the more likely you would be able to predict their behavior, including how diligently they would pay back a loan. Most loantech applications are new and have existed during a time of modest economic growth. It is easy to appear right about loan worthiness during good times – the real test is often how they perform during a slump. Even if machine learning can accurately use an individual’s digital footprint (purchase history, app use, search history, social media activity) to determine their creditworthiness, it isn’t necessary that machine learning systems will always yield better results than traditional credit measures, unless it works in a cross-channel, real-time fashion. There’s another important dimension – fraud. Banks work on thin margins because of extensive regulations and operational controls and interest fees on loan/credit products is their bread and butter. So, fraud perpetrated on these products hit them quite hard. Banks are continuously challenged by fraud, a lot of which are perpetrated by unscrupulous agents who use a variety of alternate delivery channels available today. Fraud by customers who work with accomplices (other customers and /or bank employees) take advantage of limited safeguards against fraud for loan/credit products. Also, credit departments of banks tasked with identifying / establishing customer credit-worthiness before disbursing funds, must invest more efforts in identifying account organizing frauds in real-time to handle cases internally to take quick, preventive action if/when required. Besides helping detect fraud syndicates, AI-based, real-time, cross-channel anti-fraud technology can help decline loans or keep an eye on the borrower and restrict them or favor them according to their credit risk and fraud risk ratings. Intelligent real-time anti-fraud solutions have comprehensive rule-based fraud identification mechanisms that enable banks to instantly identify fraudulent applications/loans/customers in real-time at the loan origination stage itself. These solutions enable banks to accelerate the entire credit processing end-to-end workflow and can be configured to perform granular pattern-matching against a large set of pre-configured variables to automate potential loan fraud scenarios. Digital lending helps reduce conflict in the borrowing ecosystem, reduces paperwork and moves customers to online and mobile interfaces. But what will change the game will be the accurate application of customer insights (using both internal and external data) and precise digital analytics using AI and machine learning to intervene in absolute real-time.